Over two days you will have your safety button reset as we explain the simple underlying rules of self rescue and lay the foundations for more complex procedures. This short course is also excellent for photographers who want to capture great shots of climbers in vertical locations. Address some of the most common myths related to movement on rope. All required equipment provided including ropes, helmet, harness, climbing shoes, belay devides and carabiners. Along with prussiks, slings and a variety of other software and hardware. We recommend booking the Self Rescue Level 1 and Level 2 course together. Ask us about packages. 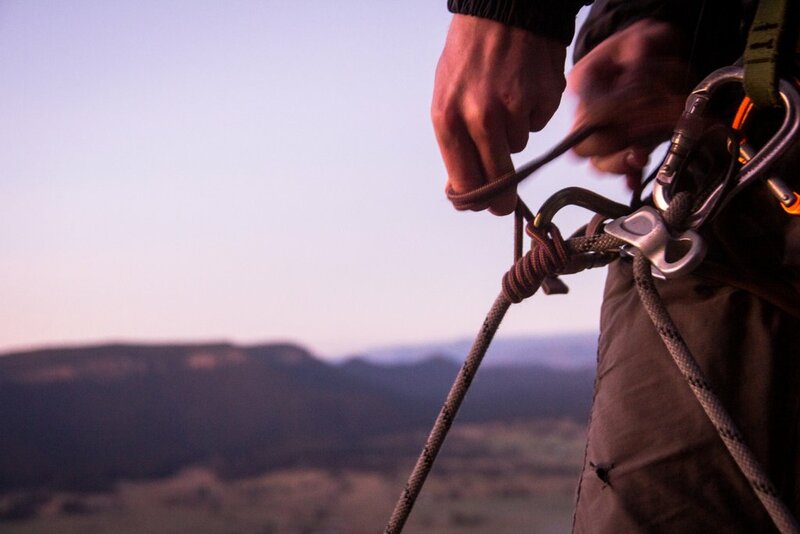 With the spectacular Blue Mountains cliffs as our venue and backdrop we cover the fundamentals of descending and ascending a rope efficiently and safely. Applying the skills learned on day 1 to more complex situations, you will also be shown how to apply your skills to prevent the most common clinbing incidents and more. 2. Whilst this course has no other prerequisites, we talk to all of the participants prior to the course to ensure that they are at an appropriate skill level before joining the course. We'll ask you about your experience, interests, abilities and aspirations to make sure that the course is right for you.